Higher employee engagement and retention among key benefits of formal mentoring programs. 29 percent of participants' organizations have formal mentoring programs, while another 37 percent of organizations have informal mentoring programs. Mentoring programs can have a significant impact on organizations’ business goals, in addition to employee professional development, according to new research from the Association for Talent Development (ATD). 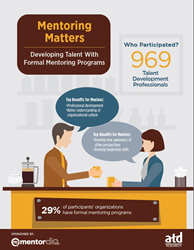 Read the full Report: Mentoring Matters: Developing Talent With Formal Mentoring Programs. The top benefits to organizations with formal mentoring programs were higher employee engagement and retention (50 percent), support for the growth of high-potential employees (46 percent), the creation of intra-organizational relationships and collaboration (37 percent), and knowledge management and transfer (37 percent). Of the 969 talent development professionals surveyed, 29 percent of participants’ organizations have formal mentoring programs, while another 37 percent of organizations have informal mentoring programs. Organizations that train mentors and mentees before or during the program in skills, such as communication, listening, and accountability, are significantly more likely to indicate that mentoring programs are highly effective at meeting their learning goals. The top three benefits mentees received from participating in mentoring programs were professional development (36 percent), a better understanding of organizational culture (30 percent), and the development of new perspectives (27 percent). The top three benefits mentors received from participating in mentoring programs were the development of new perspectives (59 percent), the development of leadership skills (49 percent), and insight into the organization (38 percent). Results showed that 57 percent thought their organizations’ mentoring programs were effective to a high or very high extent at achieving learning goals, while 38 percent of their organizations’ mentoring programs were effective to a high or very high extent at achieving business goals. Test with a pilot program. Use mentors for new hires. Evaluate performance before and after the program to measure effectiveness. Provide clear guidelines and training for all involved. Get buy-in from senior leaders. To learn more about the research attend a webcast that will be held January 24, 2018. Information about obtaining the full research report can be found at http://www.td.org/mentoringreport. The Association for Talent Development (ATD) is the world’s largest professional membership organization supporting those who develop the knowledge and skills of employees, improve performance, and help to achieve results for the organizations they serve. Originally established in 1943, the association was previously known as the American Society for Training & Development (ASTD). ATD’s members come from more than 120 countries and work in public and private organizations in every industry sector. ATD supports talent development professionals who gather locally in volunteer-led U.S. chapters and international member networks, and with international strategic partners. For more information, visit http://www.td.org.